We’re in a pickle guys, the Wrog have messed up humanity with their seemingly endless forces. Colonies, Armies, Armadas lost – it’s not looking good for us to be honest. Humanities last hope lies with Freedom Strike, a massive super-tech battlecarrier fitted with interchangeable turrets and a fleet of deployable specialized drones. 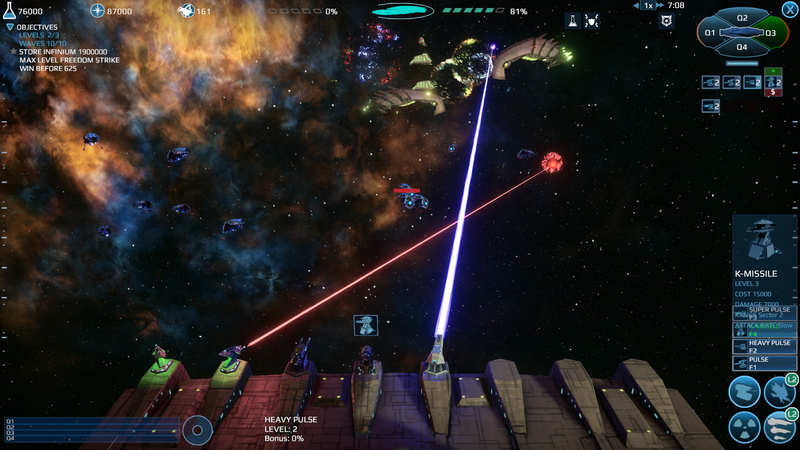 Infinium Strike from Codex Worlds is a tower defense game set in space where you’ll need to fight off wave after wave of Wrog ships by picking the right turrets for the right job and upgrading them over time in order to be able to deal with the ever increasing numbers and strength of the enemy forces. 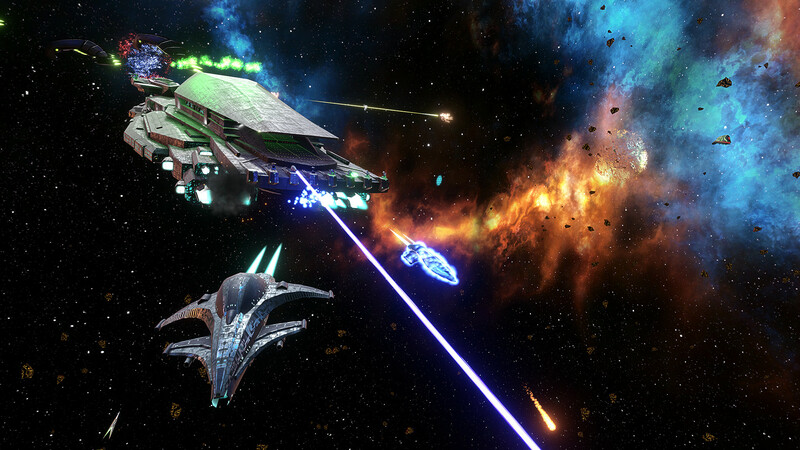 You’ll need to keep your wits about you as enemies close in from all sides, so making sure that you have your entire ship prepared is essential for survival. You have access to eight different types of turrets, each type will help you in dealing with specific threats – fast ships will need a specific turret as will larger more powerful ships. Getting the balance right for being able to deal with these threats is critical to mission success. During the tutorial mission you will get a run through of what turrets to use for which ships so you won’t be left guessing when something new pops up. Along with the deployable turrets in your arsenal, you also have a drone fleet that you can send out to directly face the Wrong. These are acquired using fleet points that accumulate over time. The more points you gain, the bigger and better the ship you’re able to deploy! I found the drones ships to be really useful in a few tricky situations. A few times things were starting to mount up on me and a well timed deployment of a drone ship would help to turn the tide and get a grip back on the situation. Finally you have TSF SuperTech – basically special moves, that you can bust out in your greatest time of need. Shields getting low? Don’t worry; use your SuperTech to replenish them. Need some more salvage? Use your SuperTech ability to grant you additional salvage from destroyed Wrog ships… that sort of thing! Getting the timing right with the use of these abilities can be the difference between success and failure. The HUD is fairly simple, but gives you enough information to know what’s going on. In the bottom left you have a time line of sorts, and little blips will appear on them heading towards the number, this indicates where the next threats are going to come from. The blips also show in different colours telling you what type of Wrog ship is incoming. The top right allows you to quickly move from sector to sector of your ship by clicking on the section number. The campaign is 10 missions long which is fairly short, but you can always replay them on different difficulties to increase the play time. I spent my time playing on the lower end of the difficulty scale because I’m not much of an aficionado when it comes to tower defence games so I didn’t wanted to get wrecked constantly. There are a total of 4 levels of difficulty and along with the campaign there is also an endless arcade more that you can play with full leader boards so you can see how you stack up against the best of the best. Infinium Strike looks pretty good, but it won’t blow you away in terms of the visuals. Sure space looks good, but at times you can’t clearly see some of the enemy ships because they’re black or just very dark shapes in the distance, so black ships on a black background…. you get the idea. The game runs really well and I didn’t notice any issue with performance or glitches during my time. If you’re the kind of person who loves tower defence games then I’d say Infinium Strike is worth taking a look at as it offers something a little different to what most other TD games are like. For others why not try the demo of the game on Steam! The game is out now on Steam and will be coming to Xbox One & PS4 later in the year. A really good review. I’ve always been a fan of the Tower Defense genre ever since playing them in StarCraft. My favorite being the Fieldrunner series that unfortunately hasn’t been updated or expanded in years. Still, I’m always on the look out for new ones and this one might be worth another look. Thank you. Thanks! I’ve not really played many not to sure why. They’re a fun genre. Lots of them out there, especially on Steam. The key is finding one that you enjoy. Plenty of different themes to check out. Definitely give Fieldrunners a try.